Nothing increases sales like cool does. 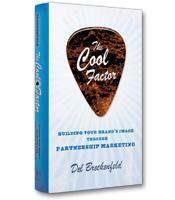 In The Cool Factor, Del Breckenfeld shows how a brand can effectively be driven to new heights by partnership marketing with “cool” products, celebrities, musicians and events. Faced with ever-increasing competition and the smaller budgets demanded by a softening world economy, product marketers can’t help but worry. There are only so many techniques one can use to get a big bang without spending big bucks. While The Cool Factor won’t solve every marketing dilemma, it does address a specific opportunity that could pay big dividends: partnering with “cool” things. The premise of Del Breckenfeld’s book is that a product can itself become cool if it partners with a cool product, celebrity or event. Breckenfeld’s experience is based on his work with one of the coolest products around: Fender guitars, the guitar of choice for legends like Jimi Hendrix and Stevie Ray Vaughan. The company’s array of instruments, with names like Stratocaster, Telecaster, Jaguar and Jazzmaster, helped to create much of the most popular music of the last 50 years. The brand is so cool, Breckenfeld says, that Fender is often approached with marketing proposals from other companies. But the book also makes ample use of stories from other marketing professionals to prove that “the cool factor” extends well beyond the music business. Much of the partnering Breckenfeld references is related to the entertainment industry. He offers welcome detail about product placement, pointing out that it isn’t only of value to advertisers. In fact, television and film producers can find creative benefit from incorporating the right products into their projects. Another entertainment type of venue is event marketing. Breckenfeld sees this as a straightforward albeit potentially expensive way for a brand to reach its core audience on a one-to-one basis. While he admits to the overuse of advertising at such events as NASCAR races, the author sees value in everything from the high-end naming of a stadium to the low-end strategy of sponsoring a simple on-site booth at an event. Breckenfeld also notes that freebies are a powerful motivator for consumers and celebrities to take the brand home from an event. Cause-marketing is not without controversy, but matching the right product to the right charitable cause can have a double benefit: It raises money for a worthy cause and provides a noble kind of brand awareness. Breckenfeld relates the story of running a fundraiser for the Fender Center, a nonprofit facility that promotes music education. He personally brought a dozen Fender guitars to Tom Petty to have them signed because he knew that would increase their value at an auction. It was Petty’s involvement, Breckenfeld says, that started the ball rolling for other celebrities to sign guitars and help the Fender Center increase its profile. Breckenfeld devotes a chapter to the use of celebrities and the “celebrity quotient” –– a measure of the equity or value of a celebrity. This chapter offers some important advice on deciding how to pursue a celebrity, whether that celebrity is appropriate for your brand and how to deal with the personality as well. Sometimes the latter can prove to be the most challenging part of the equation. A chapter on “California Dreaming” –– how to leverage the unique coolness of Southern California and its inhabitants –– is an interesting commentary on American culture over the decades.